We have unpacked the latest firing and it was largely good, some of it is quite good. A bit of it is very good, but as always there is the odd disaster. I sport a winsome smile. One single disaster was completely my fault. 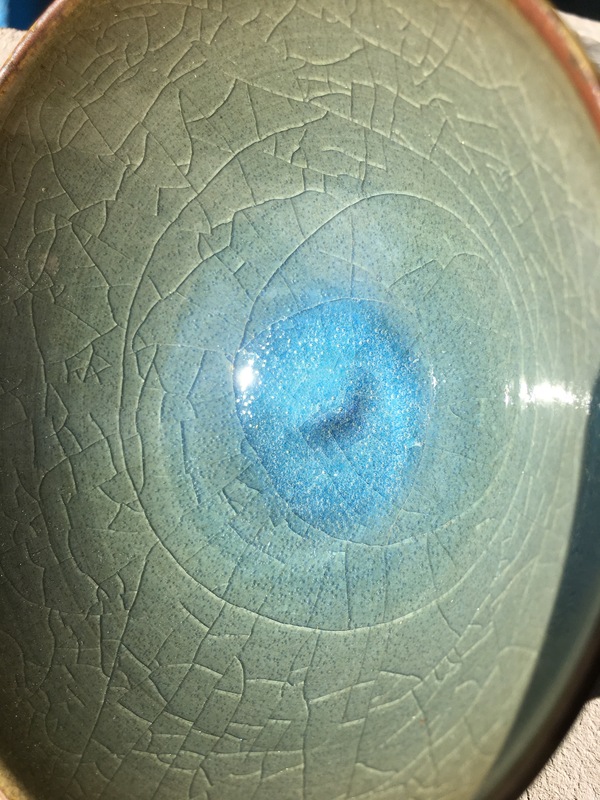 I made up a batch of glaze that has always been straight forward. Porcelain stone and limestone. 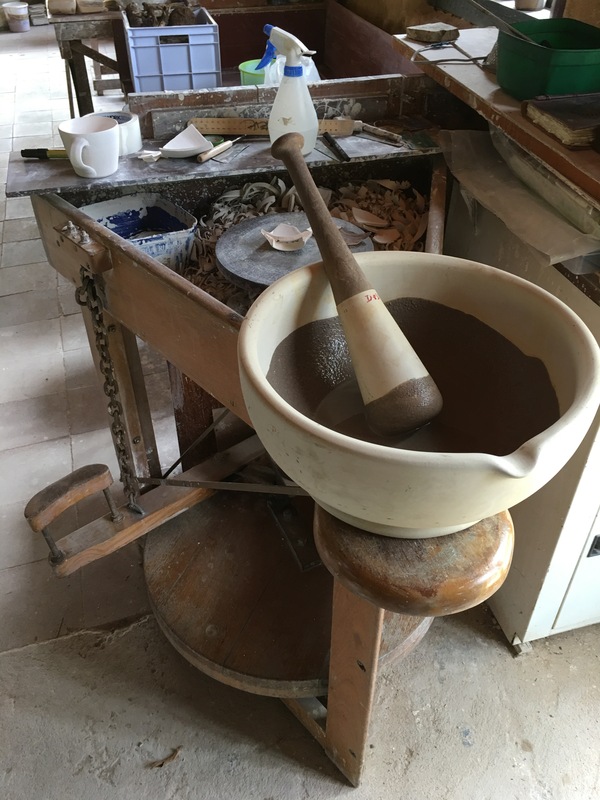 I got distracted when someone called in and It seems that I forgot to add the limestone, so I have a bowl with what is essentially a coating of porcelain body. Not attractive. The walls of my kiln are slowly dissolving with the build-up of wood ash. But not bad for 60 firings for home-made lightweight insulating refractories made from local bauxite! I usually test all new batches of glaze that we mix up, before using them on-mass. I did just this last week to test all the new batches of domestic ware glazes that we were about to use to glaze all the pots for the next firing, destined for the Southern Highlands Open Studios weekend sales. 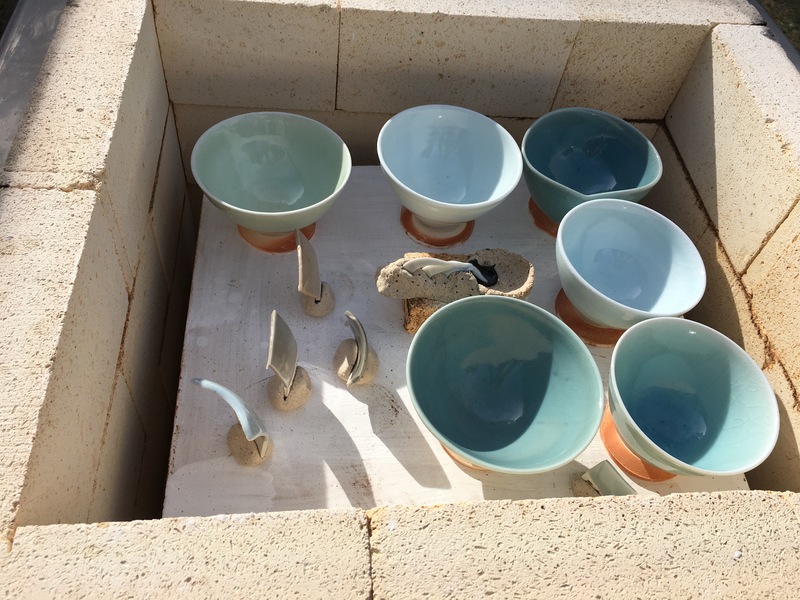 I fired the little portable wood fired kiln with test pieces and small bowls. They all worked perfectly and melted well. 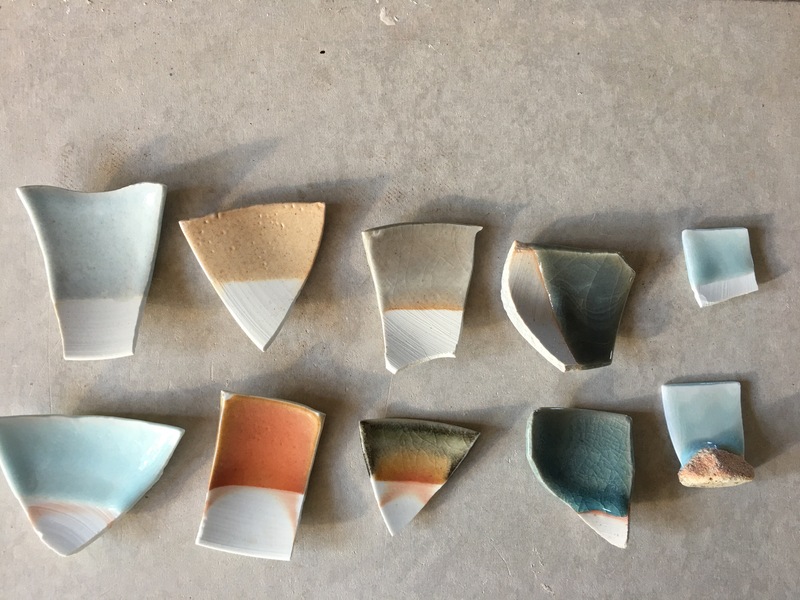 The colours that i get in a 2 1/2 hour firing in reduction to stoneware, cone 10, are not as clear and intense as what we get in the bigger kiln firing for 16 hours and with a much slower cooling. However the difference is only really marginal and the faster firing is just fine for domestic ware. I photographed both sets of tests and there isn’t a whole lot of difference. 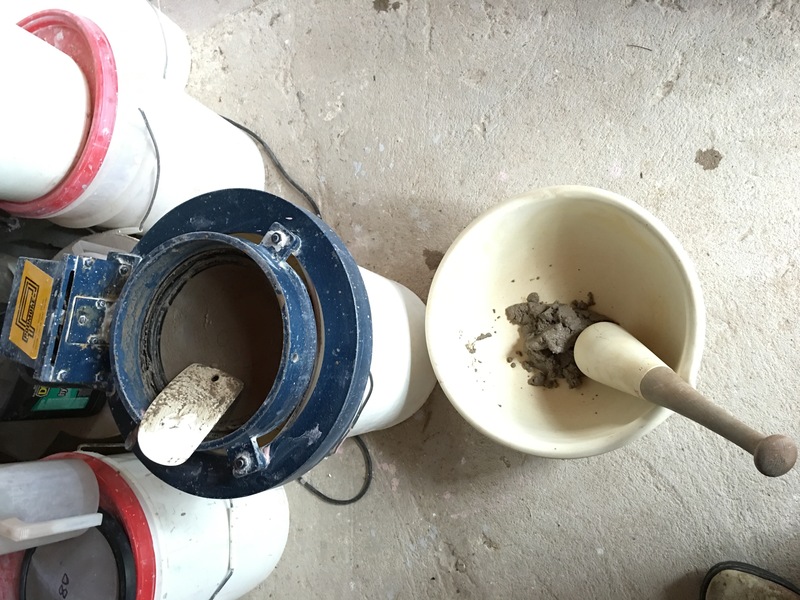 There is better reduction, especially for carbon sequestration glazes, in the longer sustained reduction firing, and the granite and pegmatite celadons are richer. Funnily, the ching-bai porcelain glaze, on the right, looks pretty indistinguishable! The tragic, sand-paper-like porcelain-stone glaze, sans limestone, was made up after this test firing, as an afterthought, so missed out on being test fired. 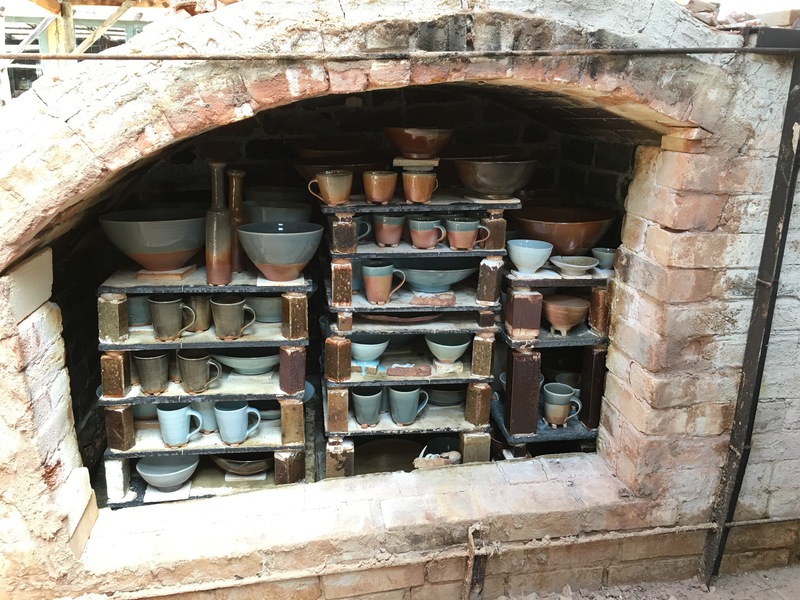 We have just re-packed the kiln to fire again. This firing will have what I hope will be a new opalescent jun ash glaze. Here’s hoping! Ash is always so variable. We have to test each batch of ash and find the differences from the last batch, then alter the recipe accordingly. 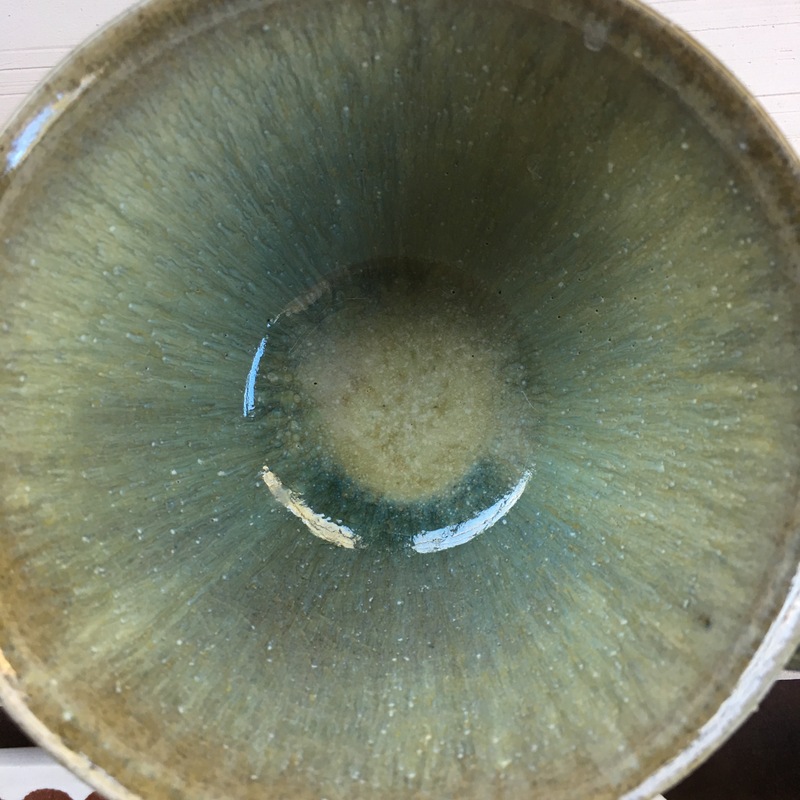 What is sometimes a blue opalescent glaze can quickly become a yellow crystalline glaze or a white matt. It changes from ‘nuka’ white through to transparent green glass with minor variations of ingredients. It always requires felspar and silica to be added. Luckily, porcelain stone is largely composed of felspar and silica. I love it so much when it works! There is something so rewarding about using the ash from the fire that cooked our dinner to make our glazes! There is something so truly organic and particularly rounded about the concept of waste-not/want-not, and self-reliance about this. 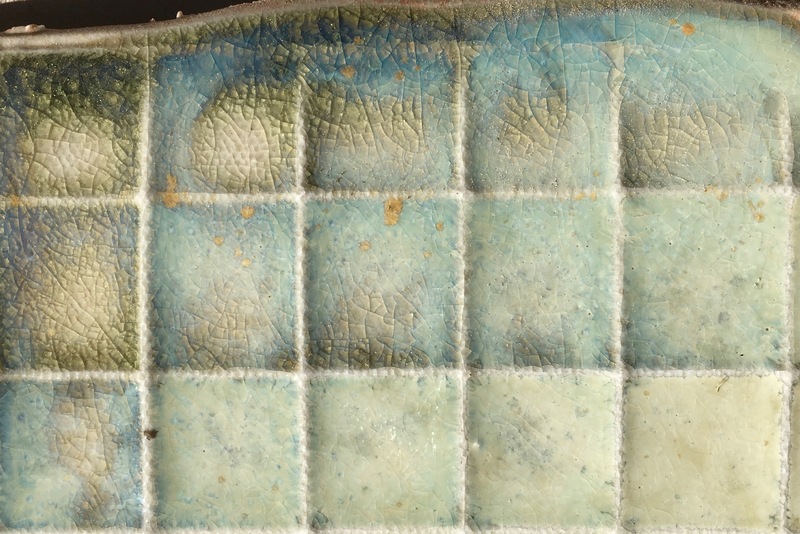 Glazes like this are firmly embedded in my sense of place and my sense of self-in-place. I couldn’t want for more – except perhaps a more reliable and richer opalescent blue? I pass the glaze through a fine sieve and although we have already dry sieved the ash beforehand, there is always a lot of material that refuses to pass through the fine screen. I scrape it off the mesh and put it in the large mortar and pestle. I give it a good few minutes hand grinding, until it doesn’t sound or feel gritty anymore. I know from past experience that it still will not all go through, but a lot of it will. I was lucky to see this 450 mm dia mortar and pestle in a junk shop and snapped it up. It’s a beauty! It dwarfs my Leach kick wheel. 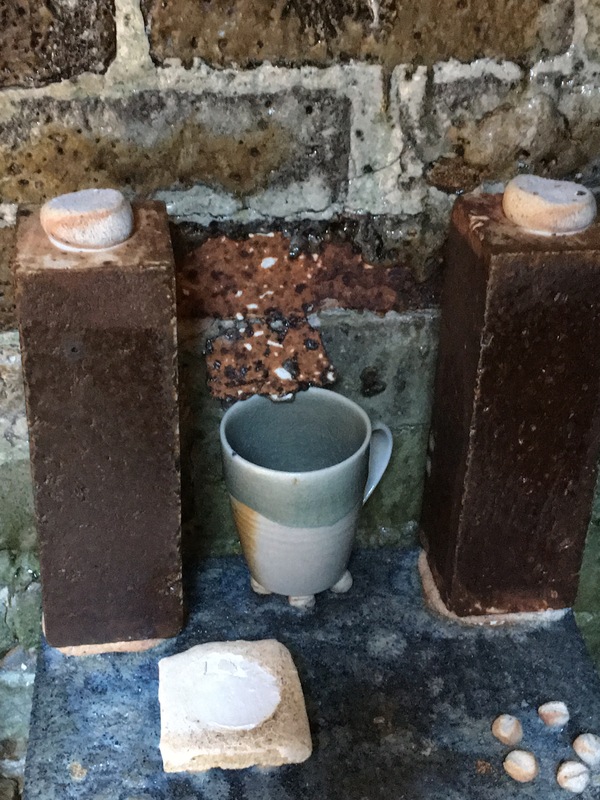 The kiln is bricked-up and ready to fire now. The weather is a bit warm and dry, so we decide to post-pone the firing until Thursday when a shower or two and some damp weather is forecast. This will be a much safer day to fire. This entry was posted in glazes, kiln firing, kilns, self-reliance by hotnsticky. Bookmark the permalink.